A muzzle can be a dog’s best friend. The easy misconception is that only dogs who bite wear muzzles. While preventing bites is one appropriate use for them, there are plenty of other reasons to put a little safety barrier between her teeth and the outside world. A muzzle prevents an aggressive dog from biting. It prevents an injured dog, such as one just hit by a car, from biting because she’s in pain (the caveat being that you have to get the muzzle on while she is in pain). Unlike an Elizabethan collar (or e-collar, a plastic cone that fits over the dog’s neck and head), a muzzle will stop a dog from chewing, licking, or otherwise irritating her allergic skin or a healing wound. She also won’t slam into doorways the way she would with an e-collar, and she can sleep more comfortably with a muzzle than an e-collar. Dogs who suffer from separation anxiety are prone to destructive chewing and ingestion of inedible materials. A muzzle can prevent this — although it cannot prevent scratching at the door. You can feel calmer while you’re out knowing your sofa is safe from teeth (though not from drool). If your brand-new adult dog or foster dog hasn’t been exposed to the dog park before and you have no clue how she’s going to react, a muzzle can make the difference between trauma and calm. If your dog doesn’t like kids but you have to babysit a two-year-old, a muzzle will protect the child and your peace of mind (although preferably child and dog would be separated at all times in any case). Bringing a new dog home to join the pack can be stressful. Muzzles can be used until everyone learns to play nice. If a dog dislikes strangers at first and needs just a little time to adjust to them, a muzzle can provide a level of calm for nervous visitors. A muzzle will stop your dog from eating weird stuff she finds on the ground during walks. Of course, muzzles are intended to provide restraint, not punishment. Do not leave the muzzle on as a matter of habit — it is intended for short-term use only. Use it for walks, going to the vet or dog park, while visitors are in your home, or when your dog is highly stressed. Remember that any snug-fitting muzzle may inhibit your dog’s ability to pant, which means it could interfere with her ability to stay cool. Think about how and why your dog will be using the muzzle before you buy one. A plastic or wire basket style allows for panting, so it’s a good choice for walks. Your dog can drink using one of these. The mesh or nylon muzzles that fit more snugly than a basket are more difficult for the dog to rub off herself. Mesh allows breathability and is a good choice for visits to the vet (unless the vet wants your dog to open wide and say, “Aahhh”). 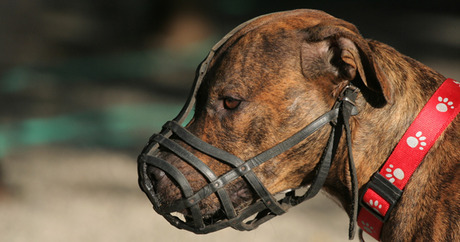 Nylon muzzles are more restrictive than the basket style and should not be worn for long. Muzzles designed for snout-challenged, flat-faced breeds like pugs are available. Specialty muzzles are made for attack and police dog training. A muzzle that fits correctly will not affect your dog’s breathing. A well-fitted muzzle should be snug but not tight and shouldn’t prevent your dog from opening her mouth — she just won’t be able to open wide. To find the right size, measure your dog from her eyes to the tip of her nose, and then measure the circumference of her face by measuring around her snout about an inch below her eyes. A collar that rides lower on the neck will help the muzzle fit appropriately.